MULAN: ... and glory. THE MATCHMAKER: This way, now, pour the tea. To please your future in-laws, you must demonstrate a sense of dignity and refinement. You must also be poised. 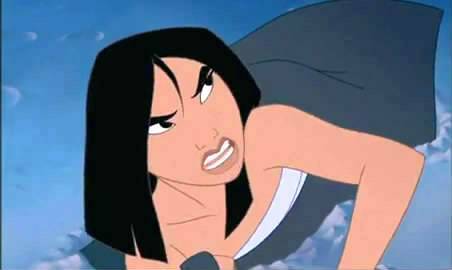 MULAN: Pardon me. THE MATCHMAKER: And silent! MULAN: Could I just take that back? One moment. THE MATCHMAKER: Why, you clumsy... Aaah! Whoo! Aaah! GRANDMOTHER FA: I think it's going well, don't you? THE MATCHMAKER: Put it out! Put it out! Put it out! You are a disgrace! You may look like a bride, but you will never bring your family honor! FA ZHOU: My, my. What beautiful blossoms we have this year. But look. This one's late. But I'll bet that when it blooms, it will be the most beautiful of all.